I was ready to give up hope. The loaves didn’t rise and the spices gave it a funky flavor. Also, they just looked really unappealing. However, I decided to give it one last try. 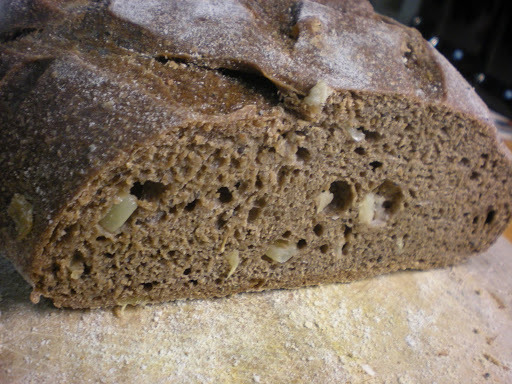 Peter Reinhart has a recipe for rye bread in his newest book, Artisan Breads Every Day. Now, this is not 100% or even 50% rye flour. 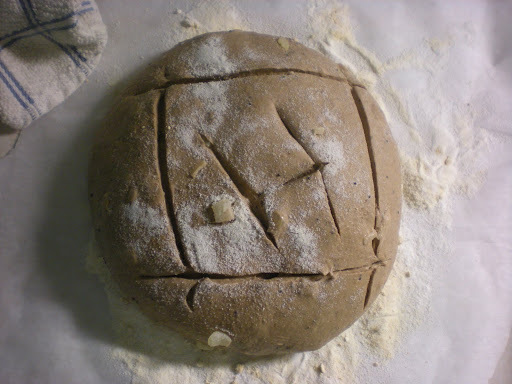 It’s about 20% rye flour. But it tastes good. And sometimes that trumps purity snobbery. 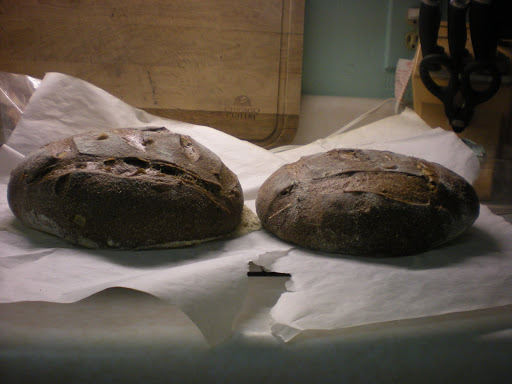 The thing I like about Reinhart’s ABED book is that he seems to have learned a lesson from WGB and now his recipes make enough for two loaves. 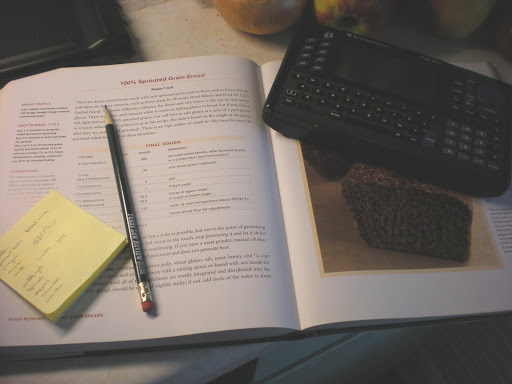 However, one thing I dislike is that he has taken the water/flour ratios out of the book so you can’t scale up or down the recipes yourself based on hydration. And as you know, I love bread math. 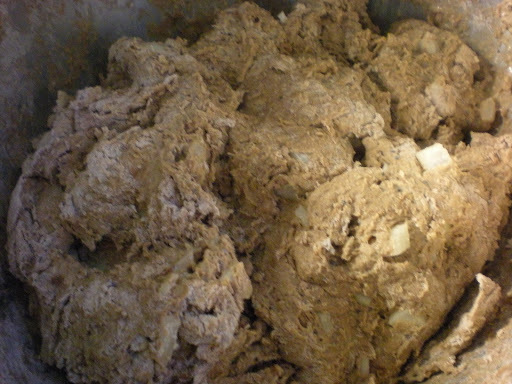 1. mix rye starter together and let sit for 6-8 hours covered. While you’re waiting for the starter to activate, you can take a look at Mr. 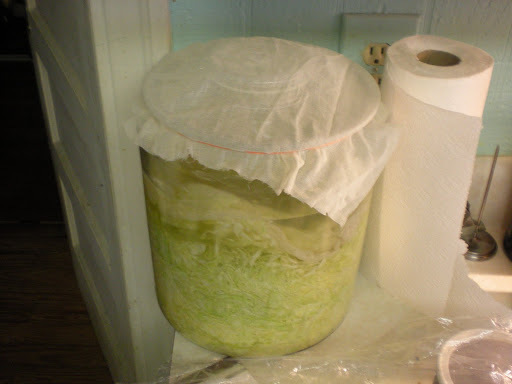 Bread Maiden’s new project, homemade sauerkraut, currently stinking up our kitchen. 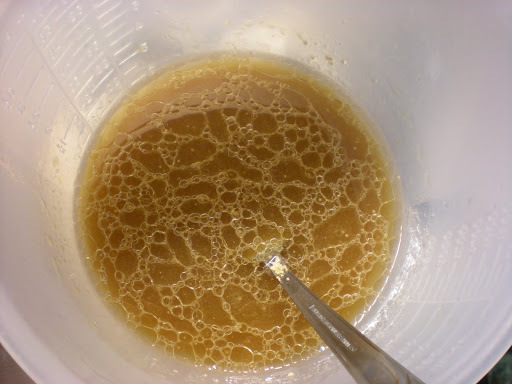 2. mix together the molasses, veg oil, yeast, and water. 3. chop up the pieces of rye starter. 4. Let the yeast mixture sit for a few minutes, then pour over the rye starter pieces. 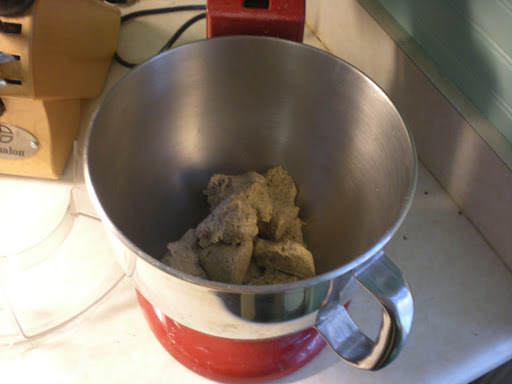 Mix on lowest speed to soften the starter. 5. 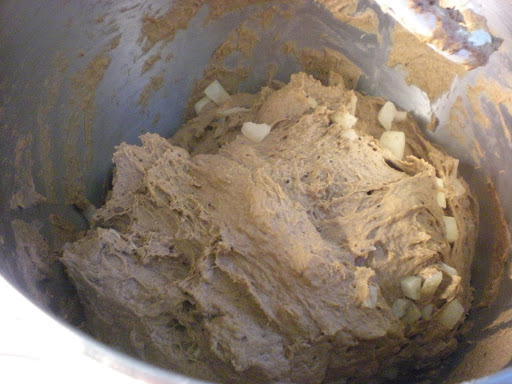 Add the flour, cocoa powder, poppy seeds, salt, and onions. Switch to the dough hook and mix on lowest speed for about 4 minutes. 6. 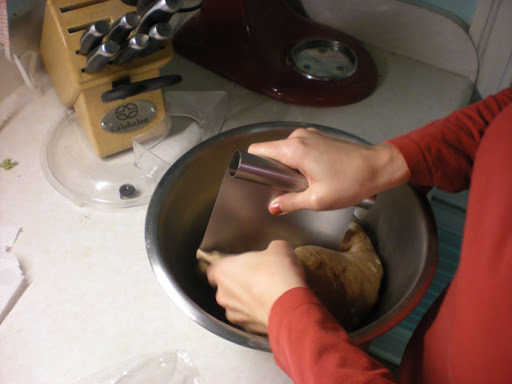 The dough will want to ride up on the dough hook, so keep pushing it down. When it looks about like this, let it rest for five minutes. 7. 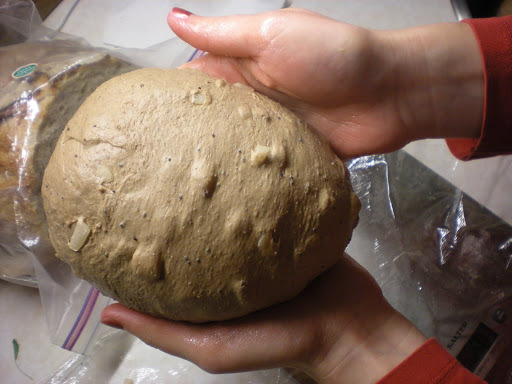 After five minutes, mix on medium-low speed to make a smooth, tacky ball of dough. 8. 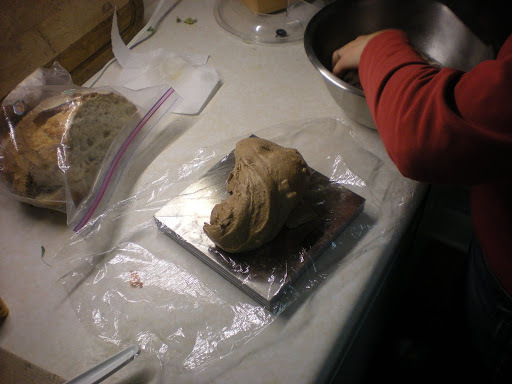 Take the dough out of the bowl and knead for a bit on a floured surface. When it starts looking good, put it in a well-oiled bowl to rise for another 90 minutes. 9. Prepare at least one piece of parchment paper with rice flour. Partition out two equal sized loaves. 10. 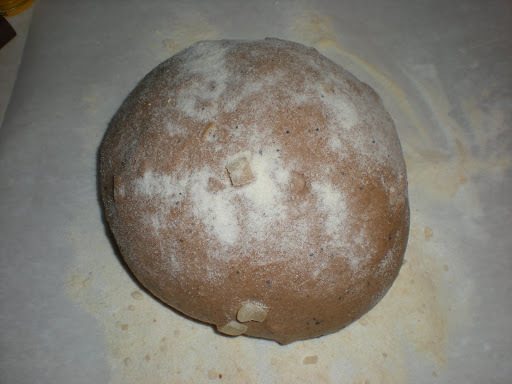 Form one into a ball and place on the parchment paper. 11. 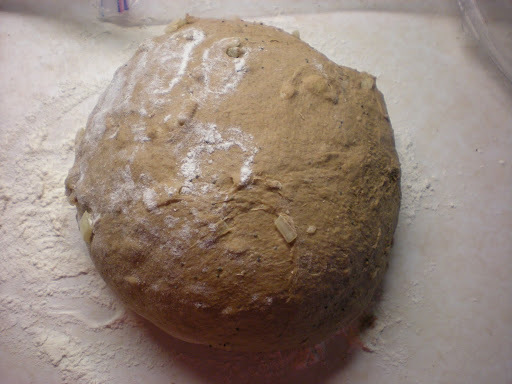 Sprinkle some of the rice flour on the top of the loaf to prevent sticking. Cover with plastic wrap and a dish towel and let sit another hour or so. 12. Preheat oven to 350 degrees F. If you’re using a dutch oven, put the cold dutch oven into the oven to warm it up. 13. Score your loaf and put it in the warm dutch oven in the oven for 25 minutes with the lid on, then 25 minutes with the lid off. Verdict? Really really tasty. 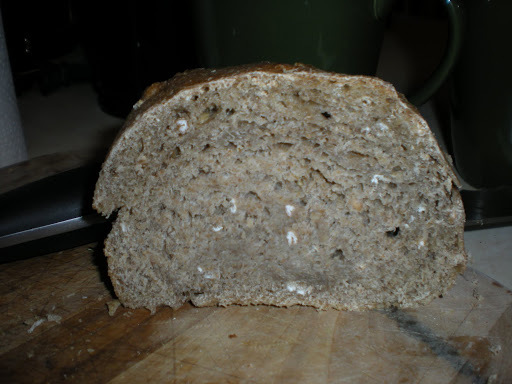 You can definitely taste the rye, even though there isn’t much rye flour in it. 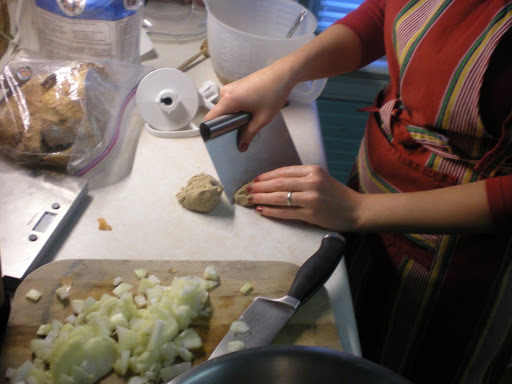 The poppy seeds and onions help add flavor too. 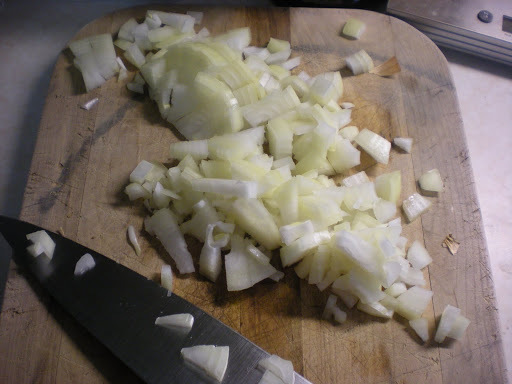 The onion pieces made funny little air pockets, which helped it not be so heavy like other rye attempts. One downside is that this really isn’t a breakfast loaf, which is when Mr. Bread Maiden and I usually eat bread, usually slathered with butter, jam, or peanut butter. This bread likes to be eaten without accompaniment. It goes well with soups though. All in all, I would definitely call this a success! The mission for 100% and 50% rye flour breads just never resulted in very satisfying loaves for me. 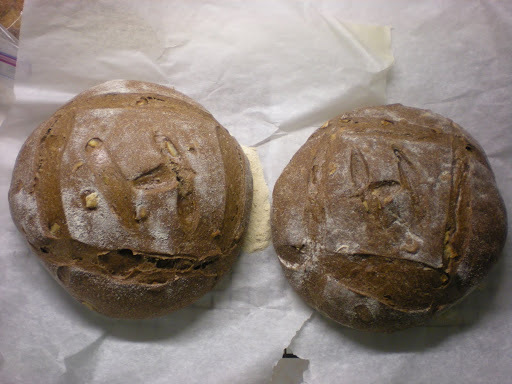 Maybe I did them wrong, or didn’t like the taste, but this Reinhart Soft Rye Sandwich bread is very tasty and sometimes that is enough for me. When making your rye starter you say to use 'starter.' 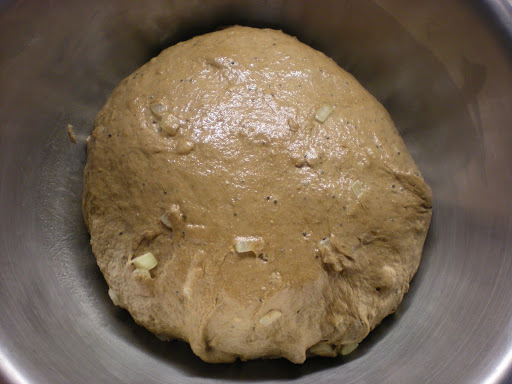 Is that, say, a sour dough starter, for example? 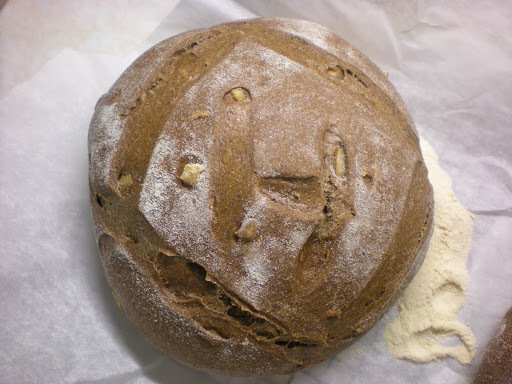 yes, I meant a sourdough starter with AP flour to make Reinhart's rye starter. Yum! I'm so excited to follow your bread making adventures. 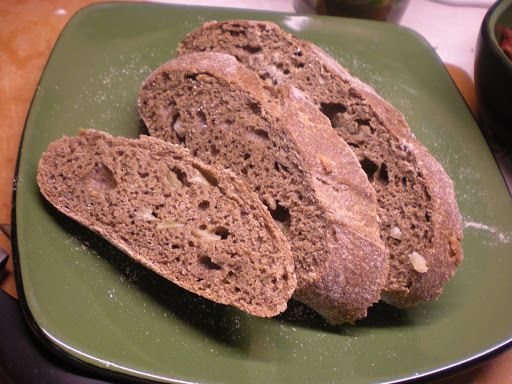 The rye bread is AWESOME! I was a little puzzled about the starter, which looked like mortar and didn't noticeably grow or physically change during its first 6 hours. But I charged ahead with it anyway — and what a payoff! The bread is very flavorful and soft. It is so good that I immediately made a second batch! Go! Make this!